I have never been a die-hard banana lover. My attitude used to be "take them or leave them" but since having children, my taste for them has changed. For anyone who has not experienced pregnancy, there is really no way to describe the ways it can change you. It's more than just physically carrying a baby. Your senses change. The baby has a strange way of letting you know what he or she wants or needs through cravings. Oddly enough, some of these changes don't go away. Both kids love bananas and I think it has permanently changed me. For example, I now really like banana desserts with cooked bananas. I'm still so-so with eating a banana from the peel, but something warm and sweet gets my attention. Also, I used to like donuts a little bit. Now I can mow down donut after donut (which is not so good for my mommy pooch). A few nights ago I was inspired. What could I make with some ripe bananas? I thought about how I could fry them. In an eggroll wrapper? Maybe. With a rum caramel sauce? Not this time. Covered in some sort of dough and fried? Yes, that sounds good. Maybe something like a Thai fried banana? Absolutely YES! I played around with the batter, thicker or thinner? It had to be thick enough to stick to the banana. I didn't want it to be too thin like tempura, but I really didn't want a fluffy, yeasty donut dough either. Also, I wanted the dough itself to have some flavor, maybe a bit of spice. My experiment yielded excellent results. Justin, Mom, and Dad were wowed. We enjoyed our fritters with vanilla ice cream topped by an extra sprinkle of cinnamon and vanilla sugar. It was heavenly! 1. 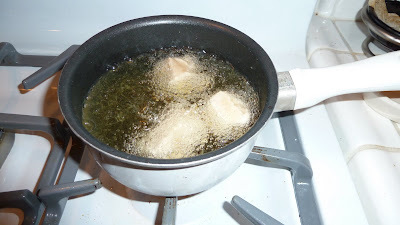 Preheat your frying oil. You don't want it to smoke, that's too hot. 2. 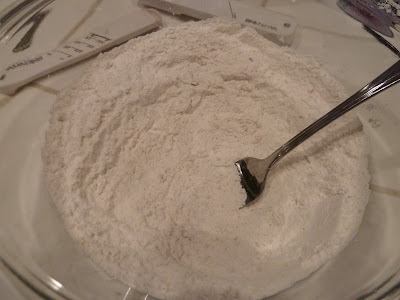 Combine flours, cinnamon and salt in a mixing bowl. In a separate bowl combine the coconut milk, water, sugar and vanilla extract. Stir until the sugar dissolves. Add this to the dry ingredients. Mix well to form a thick batter. 3. Test your oil with a small drop of batter. It should immediately boil upon contact and take about 4 minutes to brown. 4. 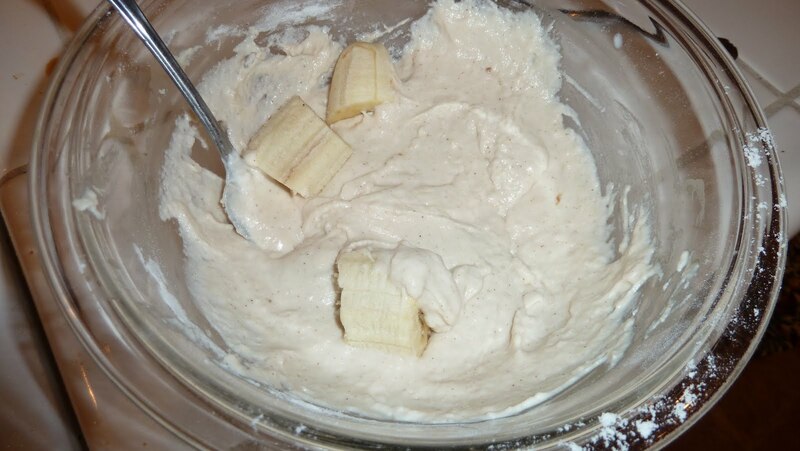 Drop banana pieces into the batter. You'll have to roll them around with a fork to cover them well. You don't want big glops of batter because they will require a longer cooking time and could remain gummy. 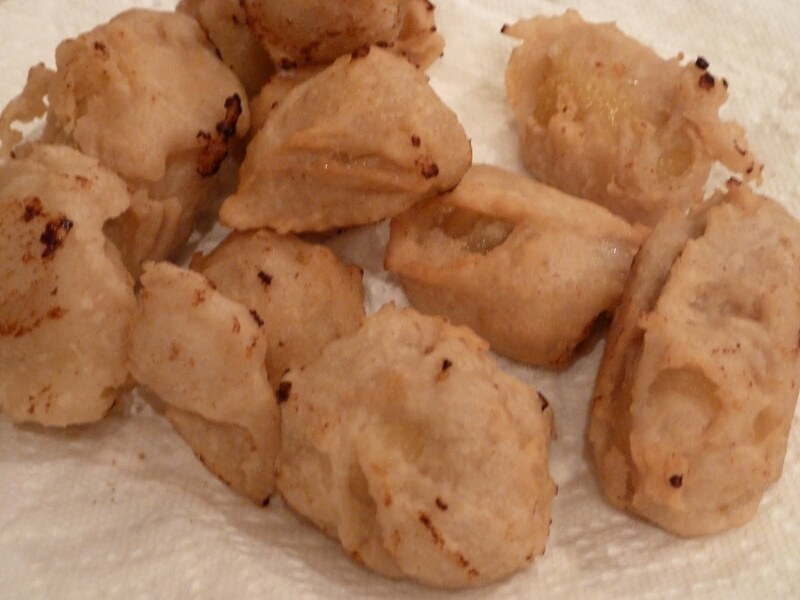 5.Transfer a few batter-covered banana pieces to the hot oil with the fork. Be careful to drop them in from just above the oil surface to it doesn't splash you. Let cook about 3 minutes. Using a fork or tongs, turn the banana pieces so they brown evenly. Cook another 2-3 minutes or until it reaches desired brownness. 6. Remove banana pieces with a slotted spoon or wire frying net. Let drain on paper towels until cool enough to eat, but still warm. 7. 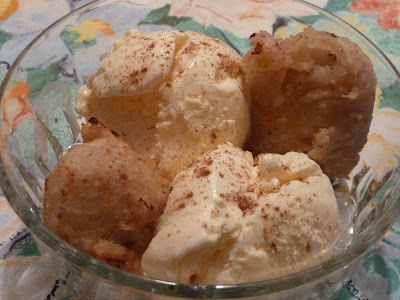 Serve 1 or 2 pieces with a scoop of vanilla ice cream. Sprinkle additional cinnamon and vanilla sugar (other coffee topping sprinkle is acceptable too). If you really want to get decadent, add some toasted nuts, caramel and whipped cream to make an over-the-top banana split. This was plenty sweet without the caramel and cream. PS, I was using Justin's new little Panasonic Lumix camera to take pictures. I like that it's little and light and usually takes decent photographs. However, I'm not so thrilled with the photo quality today. Many shots were blurry from it using the automatic metering mode, and the perspective is a bit skewed. I guess it's not so great for this sort of detail. I will be going to back to my Canon DSLR for food photos from now on. Oh well, gotta try new things out sometimes.